The 10,800-goal is especially challenging because it requires a net improvement in shellfish harvesting areas. That means when any shellfish beds are closed by pollution, that number counts against the total. 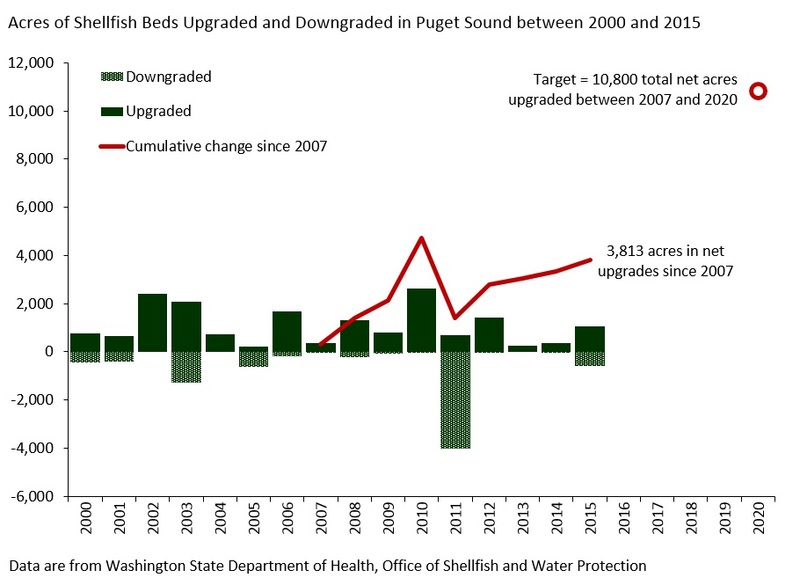 In 2011, about 4,000 acres of shellfish beds in Samish Bay near Bellingham were downgraded from “approved” to “conditionally approved,” which prohibits harvesting after significant amounts of rainfall. That downgrade was a devastating setback, a major reversal toward the 10,800-acre goal. Officials in the Samish Bay watershed are working hard to clean up the pollution that caused the downgrade. 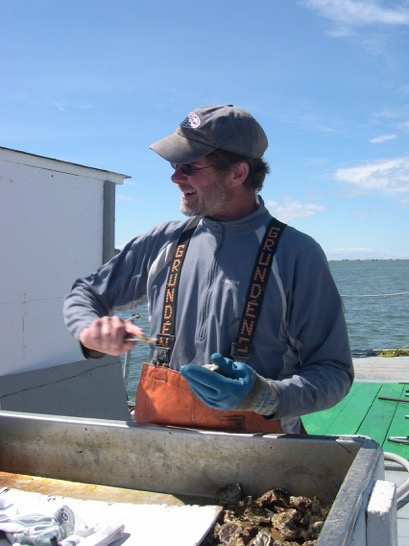 Water-quality data show that they are getting closer to standards that will trigger an upgrade and resumption of year-round shellfish harvesting. The pathway to reaching the 10,800-acre goal requires that Samish Bay be upgraded to its previous status to remove the 4,000-acre deficit, said Scott Berbells of the Washington State Department of Health’s Shellfish Program. In addition, several other growing areas with ongoing cleanup programs must be successful. Trends in water quality are highly variable. They may show improvement for a time, then show a decline. That’s why it is difficult to predict whether improvements in a specific location will be enough to allow shellfish harvesting to resume. Especially challenging are watersheds with a lot of livestock and aging septic systems located where the soils don’t absorb much water. The pollution problems can be overcome when property owners are willing to work on solutions with the help of available experts. Sometimes it requires enforcement actions. Because success in cleaning up pollution is so dependent on the response from the community as a whole, I focused my primary story on Drayton Harbor near Blaine, where the community worked together to overcome pollution. Getting the community involved is considered critical to any successful pollution-cleanup effort, according to the Implementation Strategy being developed for Puget Sound shellfish restoration. In Drayton Harbor, Geoff Menzies dedicated nearly 30 years of his life to restoring the shellfish beds, in part because he believed passionately in the quality of shellfish that can be grown in the bay. In 2003, Geoff and Betsy Peabody were named Local Heroes for Puget Sound by Gov. Gary Locke for starting a “community oyster farm” under the umbrella of Puget Sound Restoration Fund. Jeff and Betsy always believed that harvesting could be restored if the community were to take ownership of the problem. Geoff Menzies during era of Drayton Harbor Community Oyster Farm. Geoff was also named an environmental hero by the group Resources for Sustainable Communities, and he was later honored by the Washington Environmental Council, Whatcom Land Trust and Environmental Protection Agency. Leaders in shellfish-restoration efforts throughout Puget Sound always seem to reflect the real credit onto property owners in the watershed. 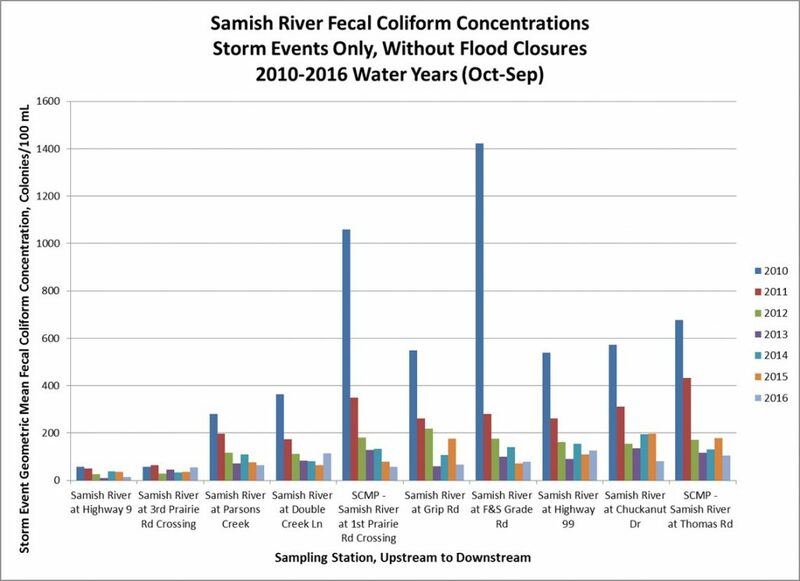 That’s certainly the case in Samish Bay, where entire communities worked together to reduce the impacts of human sewage, for example. For information, including a list of actions that people can take, go to Puget Sound Partnership’s Vital Signs for Shellfish Beds.